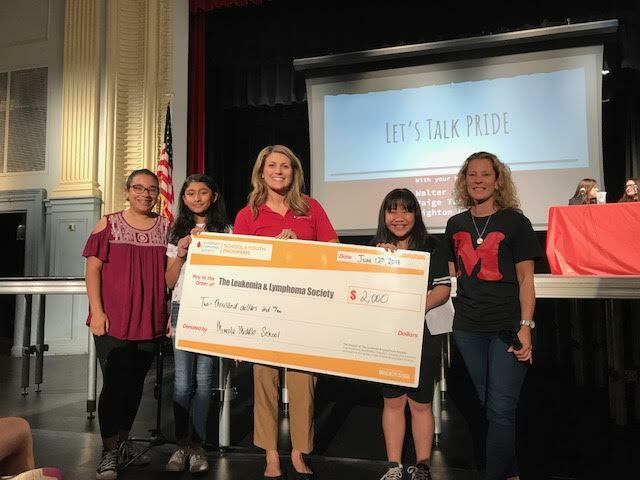 Mineola Middle School’s Community Action Club recently presented a check for $2,000 to the Leukemia and Lymphoma Society. The club raised funds through a Pennies for Patients Drive, as well as by hosting a Pie-In-The-Face Contest for additional donations to the cause. Kerianne Stein, a representative from the society, visited the school on June 12 to accept the donation. Photo caption: Mineola Middle School’s Community Action Club recently presented a check for $2,000 to the Leukemia and Lymphoma Society.